Harris Armstrong talk at Masonry Institute ! 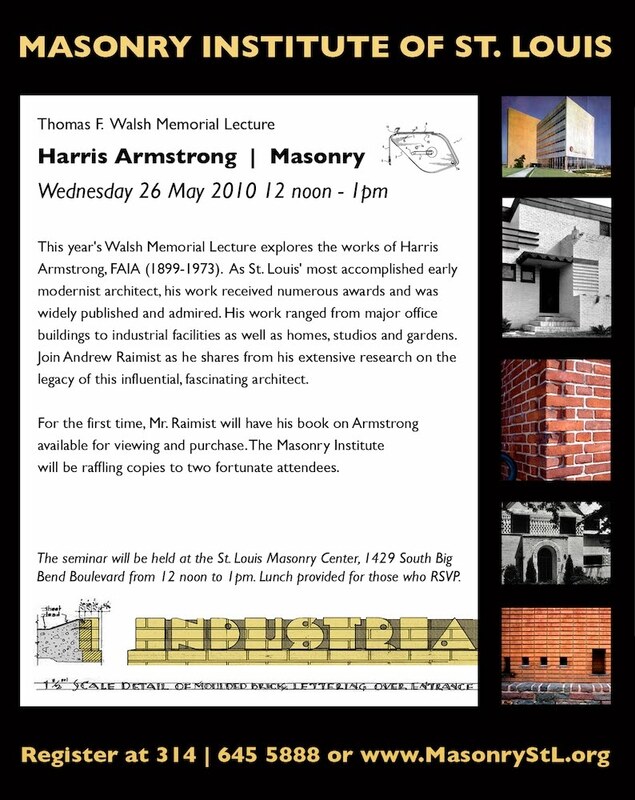 Andrew Raimist will be presenting a seminar on Wednesday 26 May 2010 on modern architect Harris Armstrong's interest in, use of and influence on the practice of masonry construction. The event will be held at the Masonry Institute of St. Louis (MISL). 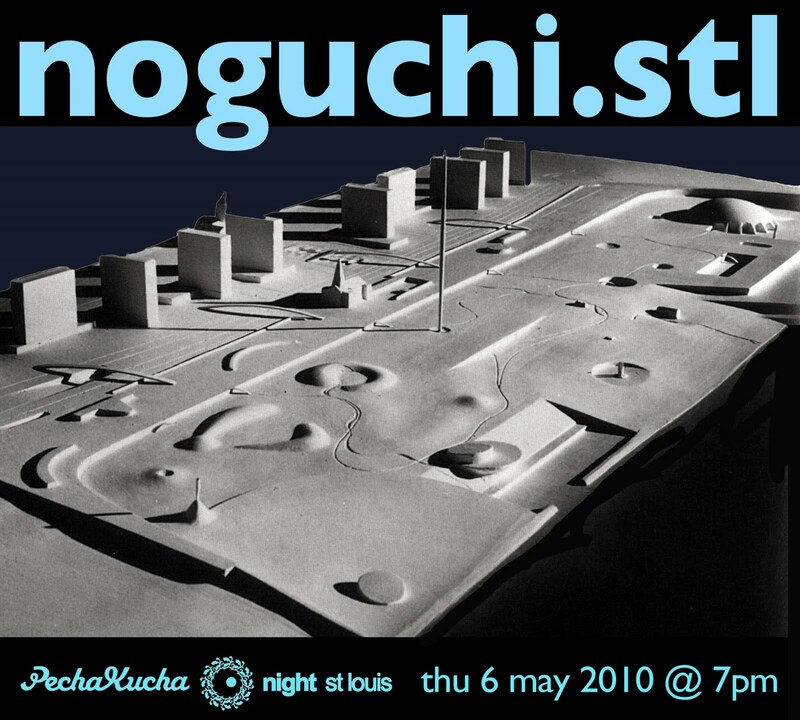 Andrew Raimist will be giving a talk entitled "noguchi.stl" at the third Pecha Kucha held in Saint Louis on Thursday 6 May 2010 @ 7pm at Mad Art Gallery. The presentations will all be based upon the 20 X 20 format: 20 images x 20 seconds per image. Visit the PK•StL website for more details. There is no cost for attending the event. All are welcome. • Noguchi's concepts for sculpting the earth and its connections to Native American Indian mounds. • The critical influence of the Midwestern history, culture and landscape on Noguchi's formative years growing up in Indiana. • Noguchi's collaboration with the New York modern architect Edward Durell Stone in developing an entry to the Jefferson National Expansion Memorial Competition. • The visceral connection between Noguchi's desire to mold the landscape and evocations of the human body represented in the earth. • Noguchi's collaboration with Saint Louis modern architect Harris Armstrong on the iconic Magic Chef lunar landscape. • The significant, original Noguchi plaster model for the Magic Chef ceiling in the collection of the Saint Louis Art Museum. • The impact of Noguchi's confinement at the Poston Relocation Center (for US residents and citizens of Japanese origin in 1942) upon his conception of the purpose and meaning of art, sculpture, and landscape. 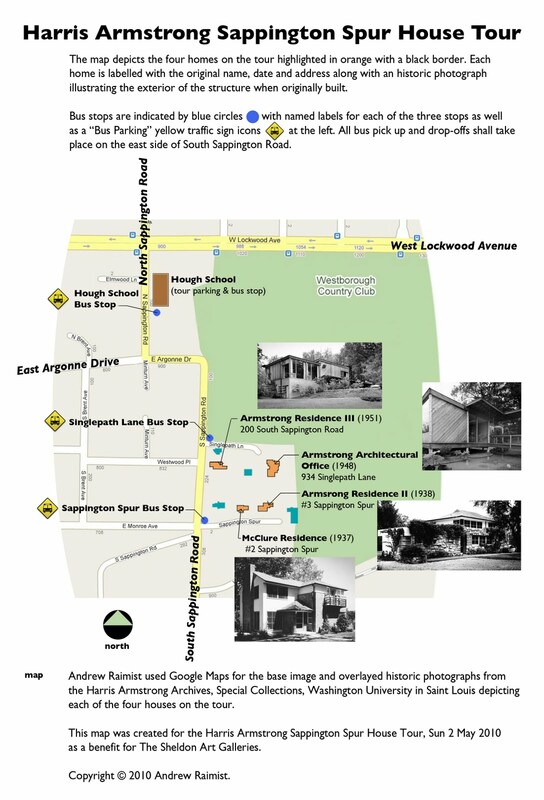 This map indicates the homes of the Harris Armstrong house tour to be held on Sunday 2 May from 2pm to 5pm. You may wish to print out this image and bring it with you to the tour. The house tour is a benefit for the Sheldon Art Galleries. Tickets for the tour will be available on Sunday on site. 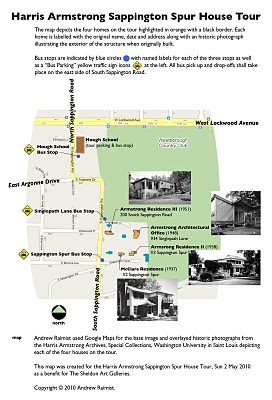 Park at the Hough School (at the corner of Sappington and Lockwood) and take the shuttle bus to Sappington Spur. Homes will be open to tour between 2 and 5pm. You may also be interested in attending the "After Party" for "Golden Key Ticket" donors which will include limited edition photograph, slide talk by Andrew Raimist, and party at #3 Sappington Spur.